Personal service is physically handling a serving a process to the individual named and identified on the summons. The individual named on the summons is the only individual who is legally able to accept the service of process from the process server or sheriff. A plaintiff is an individual who initiates a court action such as a lawsuit by filing a complaint with the clerk of court. This is the party who complains or sues in a civil action and is so named on the record. A priority process is one of four levels of service that Writ Legal offers in regards to service of process. A priority process is a level of service that Writ Legal offers. Service is attempted within one to two days. 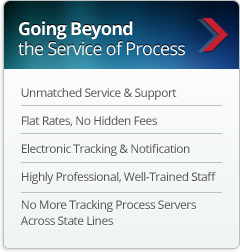 Other levels of service include Standard Process, Express Process, and Urgent Process. A Private Process Server is referred to as a person hired by an individual (pro-se), attorney, law firm, or similar organization to serve a legal process. In general, private process servers are able to serve legal documents pertaining to civil matters but not criminal matters. Sheriffs or similarly situated individuals are able to serve legal documents pertaining to civil and criminal matters. When serving a civil process, all process servers must comply with local, state and federal laws. Furthermore, some private process servers require proper licensing credentials in order to legally serve a process. A proof of service is a type of legal document that shows proof that legal documents were delivered to an individual involved in a legal matter. The proof of service, also called a return of service, must be filed with the clerk of court showing proof that service was completed on the individual/entity in question. Some courts refer to a proof of service as an affidavit of service or return of service or certificate of service. A notary public is a person authorized by the state in which the individual resides to administer oaths, take acknowledgments, and authenticates that an individual is present and who he/she represents themselves to be based on the identification presented and the document must be signed in the presence of the notary verifying its authenticity with the notary seal/stamp.